Studies show that almost 92% of people will experience at least one cavity over the course of their lives. Thankfully, tooth-colored fillings are available today to help make the treatment process as seamless as possible – no more silver spots in your smile! Made from high-quality composite resin, these fillings can be shaded to provide a precise match to your enamel, and their flexible structure also preserves more of the original tooth for stronger, longer-lasting results. At Roselle Park Dental & Implants, our doctors and team members look forward to helping you regain your oral health in ways that exceed expectations. Please contact our Roselle Park, NJ location today to schedule your first appointment, or if you have any questions we can help you with. In most cases, your filling can be placed in just one appointment. 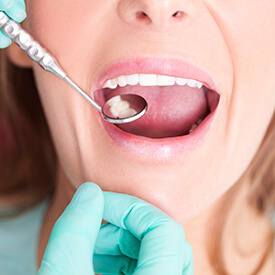 After providing the appropriate numbing, one of our doctors will remove the decayed portion of the tooth while taking care to preserve as much structure as possible. After thoroughly cleaning the area, the composite resin material will be applied, shaped into position, and then hardened with a special curing light. While patients can expect to experience some mild oral sensitivity following their filling placement, this discomfort should subside shortly.